The final performance of the Rockfish Roll Out (read: the last of the three pounds of fish) took the form of a show-stopping summer salad. A refreshing Celery Salad – also starring in an encore performance – topped the Rockfish and Red Lettuce, with both stalk and leaves in play. 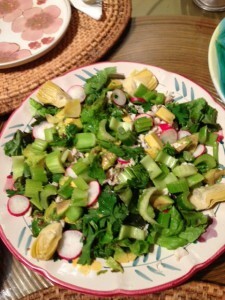 Organic Radishes, Parsley, Capers and Artichoke Hearts completed the cast, all drizzled in Lemon and Key Lime Juices. In the supporting role, warm Whole Grain Sunflower Seed Bread from Trader Joe’s simply dazzled with its topping of Affi’s Aubergine (Fire Roasted Eggplant and Garlic) spread. A final nod goes to Kunde Family Estate Wines. Like the award for Best Choreography, their Chardonnay made the whole show move. Final credits: Saveur Magazine, Costco, Nunez Farm, Gump’s (for the $5 platter from the employee sale) and to Mom for the Denby Dinnerware!